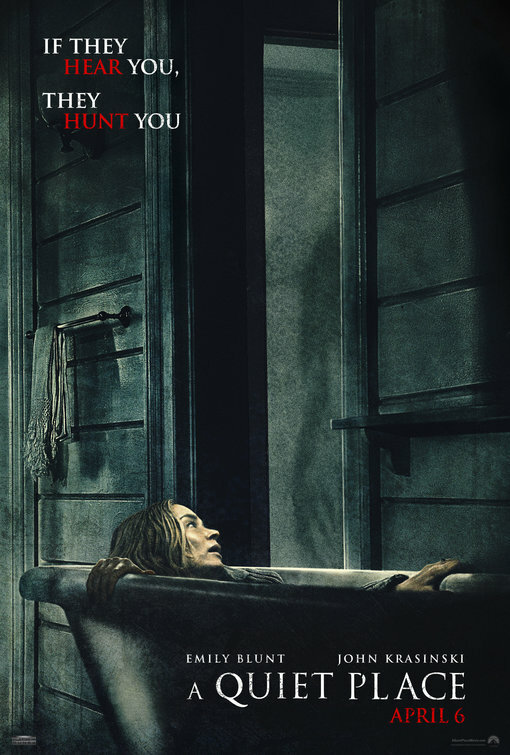 A Quiet Place is a horror/thriller, heavy on the thriller as I was on the edge of my seat the entire time, desperately looking to grasp on to anything to brace myself. A Quiet Pace is the story of a married couple, Lee (John Krasinski) and Evelyn (Emily Blunt), who are the parents of three children (Millicent Simmonds, Noah Jupe, and Cade Woodward). This family lives in what seems to be a post apocalyptic world where alien monsters arrived and, while blind, respond violently to any sound that is made. So in order to avoid being immediately slaughtered by these hideous creatures, the family is forced to live their lives without making any sound whatsoever. Therein lies the tension because the human race is not meant to be a quiet race. John Krasinski is also the director of this film and he does an absolutely tremendously spot on job. Despite the fact that the dialogue is basically eliminated from the film, the manner in which he tells this story is amazing. One of the best parts to me is that Krasinski does not waste time with endless exposition explaining what has happened to the world, or how this family has survived up to this point. None of that is important. Krasinski provides some newspaper clippings that help fill in some of the blanks, but the rest of it is left up to the imagination of the audience. The cold open begins with a black screen with the words 89 days on it. This tells you that whatever it was that caused this apocalypse has happened. Then after the opening (which leaves you breathless, by the way) the film jumps to day 472 (around there). Because of that, it seems obvious that this family has spent most of the last 390+ days figuring out how to live with the minimal use of sound. And I accepted that completely. I did not feel the need to know every little detail about how things work or what had happened to get them to this point. The film drops you into this point in time and you go with it. Exposition weighs down so many movies that the distinct lack of exposition was a novel way to go. The sound editing of this movie is absolutely brilliant. The silence is played perfectly, and every little sound is masterfully placed for maximum intensity. There are some jump scares, but they are well done and are placed int he film in exceptional locations. They fit and this movie by no means depends on them. They are just simply another tool that this film uses with utmost proficiency. Then, the performances are mind blowing. Emily Blunt has so much skill in conveying what she needs to with her face and her body and her attitude. Krasinski is powerful here and he had me completely engaged with his character. Both main children, Millicent Simmonds and Noah Jupe are amazing. Simmonds is in real life deaf and so is her character Regan, and the film does this very creative technique to demonstrate that whenever Simmonds has the point of view. It was very effective. They also showed the use of sign language, which was one of the way this family communicated with one another and it was compelling. I have never seen someone yelling at each other in sign language, but I did see it here. Amazing job by these actors. There is a great connection between these characters who are dealing with so much more than just these monsters that will kill them if they make any sound. There are intricate problems between each character and these actors bring out the best in each other. Another great thing is this family of characters are shown to be very intelligent instead of the bumbling idiots that usually take up horror movie space. I love that. They were doing things that made sense and even those choices that might not be wise are done in service to the characters. It is apparent that the characters are the most important part of this story and everything else just goes to help show who these characters are and how they are going to grow. And you believe it totally. The creatures were made by Industrial Lights & Magic (ILM) and it shows because these monsters are terrifyingly authentic and look to be right out of someone’s nightmares. There is no troubled CGI here. However, Krasinski wisely does not over use the shots of the monsters and use them at the proper time to illustrate the characters and the terror of the situation. There are so many moments when I was simply holding my head and wondering if this film could be more tense…and then it topped itself. I legitimately came out of this movie with a physical visceral anxiety, amazed at what I had just seen and shaken by the process of seeing it. I sat through to the end of the credits not because I wanted to see them or expected any post credit scene, but because I needed to take a breather. This is maybe my favorite movie of the young year so far. I was completely invested in the film and the characters as I gritted my teeth and held my breath through each anxiety filled scene. A Quiet Place is an original film with great performances, a well-told story that does not bog itself down with unnecessary exposition and tension from the get-go. Great job to all involved.